Tariffs have long been used by presidential administrations in the United States to affect economic change. To the average American, however, tariffs may be among the least understood economic tools. Many people are unaware of how important tariffs have been to cementing the U.S. economy as a global leader. Fewer still understand the effect tariffs can have on today’s international stage. Although discussions surrounding tariffs tend to be prohibitively esoteric and based on macroeconomics, the average American is directly affected by most new tariffs. Tariffs are a highly political economic tool, typically called on to protect domestic production and jobs, and understanding a politician’s stance on them can offer insight into their understanding of the economy and world affairs. The basic definition of a tariff is a tax or duty on a class of imports or exports. However, that is not the whole story. A tariff is technically just the schedule of duties, or taxes on imported goods, that are applied to specific products by a customs agency as it crosses a border. The purpose of a tariff is to increase the cost of importing that good, which could improve the prospects of producing it domestically instead. Sometimes, the aim of levying tariffs is tied to generating revenue for the federal government. Some tariffs only apply to certain areas of the world, while others are enacted on a type of good (like steel and aluminum), no matter its origin. In every case, it is a specific good that has a tax enacted on it, usually increasing the price of the good for both the producer and the consumer. Which goods are taxed and from where is determined by whatever body handles trade in a given country. Who can enact a tariff? In the United States, tariffs can be enacted by an act of Congress or a body granted that power by Congress. Throughout American history, Congress has passed several statutes giving the President the ability to control tariffs, given certain conditions. As a result, the president has almost sole control over this important area of trade. 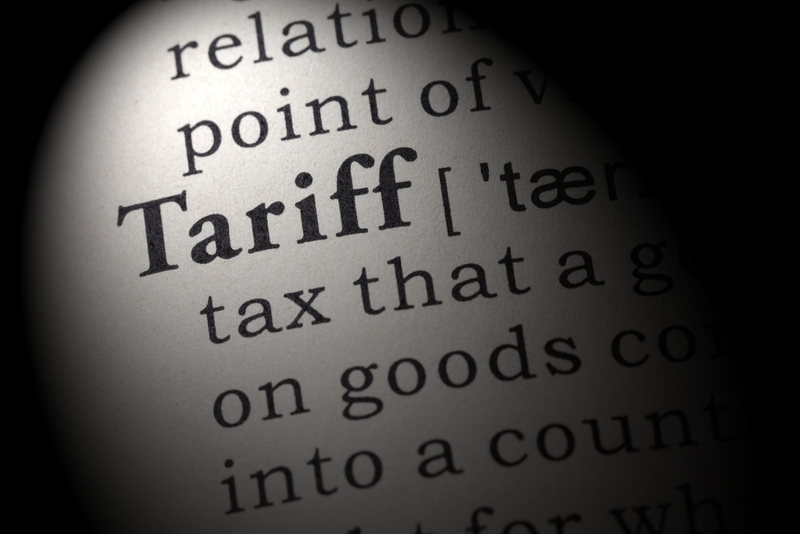 Although there is a limit to these powers, the process to reverse unjust tariffs is a lengthy one and it’s possible a tariff can run its course, or at least begin to have considerable impact, before a ruling body ever has a say about its constitutionality. As a function of these limits, there is legal backing for a president to levy tariffs on specific countries but there are no grounds to target specific companies. That’s why President Trump pledged, as a candidate, to enact new tariffs on China and Mexico instead of simply punishing businesses that, in his view, are having an adverse effect on the American economy. The bill for a business hoping to produce or purchase goods that have been marked for duties varies based on a few factors. In the simplest method, a percentage tax is calculated using the actual transactional value of a good or product once it reaches its destination. However, there are many stages to trade and sometimes goods can be transported before a value has been agreed upon. In this case, customs agents would use the international Harmonized System, a universally-used method that assigns a code to all goods traded internationally. That code then refers to a database with information about a product’s universal value provided by recent trade activity. The United States, in particular, is known throughout the world for being more than willing to use tariffs to protect its economic needs. Before income tax was implemented in 1913, up to 95 percent of the federal government’s revenue came from tariffs. Early on, this may have been a policy that significantly increased American manufacturing and domestic production. In fact, one of the first actions taken by Congress after the Revolutionary War was a declaration of tariffs designed to finalize the economic independence of a fledgling nation. This led to a series of events, culminating in the War of 1812, that gave the United States a reputation for self-sufficiency and harsh economic protectionism. The first battle of the Civil War might have been a legal one created by a dispute over tariffs. Southern interests were directly harmed by tariffs, as their region was primarily agrarian and reliant on imports. When South Carolina threatened to ignore a new tariff, the federal government threatened military action against the state. Tensions dissipated but were never forgotten. Even after the bloodiest war in its history, the United States did not relent from its protectionist policies. It wasn’t until the Marshall Plan and the emergence of the United States as a global superpower that public and political opinion shifted towards free trade. Some point to the Smoot-Hawley tariff, a bill many economists say worsened the Great Depression, as another turning point. In any event, by 1945, a bipartisan consensus emerged that has consistently supported the idea that trade should be fostered and rarely limited. There are a few examples of modern tariffs being enacted, but the results have been invariably lackluster, to say the least. President George W. Bush created a significant backlash when he announced steel tariffs in 2002. His tariffs were designed to improve the economy in only a few battleground states but to negatively affect heavily Democratic states. After significant international pressure for nearly a year, he relented and was reelected. With new tariffs being a significant part of current international trade, their influence will likely grow in the near future. It should be noted, however, that there are few fans of this method among economists. When Reuter’s conducted a poll of President Trump’s decision to impose tariffs on close allies in 2018, not a single one agreed that they would have a net positive effect on the American people.